LUXURYLOGICO is an artist group. Different versions of a ‘wonderland’ derive from different cultures. In the West, we have learnt the renowned English story of Alice’s adventures, where the young girl falls through a rabbit hole into a world of fantasy. This land connects to our everyday reality and yet, it is somehow hidden and can only be visited through dreams and imaginary journeys. In the East, for example, a compilation of geographical and cultural accounts are the origins of Chinese mythology and first appeared in the Classic of Mountains and Seas (Shanhai jing) in the fourth century BCE. And in South Asia, surrounding the base of Mount Meru in Hindu mythology, the legendary Himmapan Forests, are believed to be the home of many supernatural beings, which are blessed under the heavens, invisible to the human eye and inaccessible by mortals. In this curatorial project the wonderland is revisited from its very edge. The term ‘edge’ included in the title has three signifiers. First, it is simply geographically indicative. 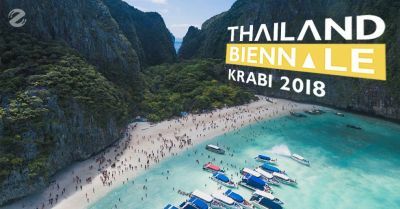 Similar to other provinces of Thailand on the west coast, Krabi and the venues of the Thailand Biennale in particular, are situated on the coastline and can be seen as part of the edge of either the mainland or the Andaman Sea. It is the start and at the same time, the end of a territory, from which it belongs and departs. Second, edge has its own historical and cultural significance in the region, since two ancient swords (krabi in Thai) were unearthed in the late 19th century, and seen sacred above all natural existence. Third, conceptually, in the context of wonderland, edge is precisely the borderline between in and out. It is a pivotal point; like the rabbit hole in Alice’s adventure, between reality and fiction, the existent and the imagined, the material and the spiritual, the experienced and the unworldly, and ultimately, the known and the unknown. This inaugural Biennale in Thailand curated by Jiang Jiehong (UK/China) and the team will invite up to 100 artists worldwide. It engenders a new way of thinking, stimulates dialogues and conflicts when the global meets the local, and invites all to take a creative journey through art, nature, tourism or everyday life, starting from Edge of the Wonderland. Leung Chi Wo, artist’s rendering for Monuments for Solitude, telephone booth, fossil, dimensions variable, 2018, courtesy of the artist. Chemi Rosado Seijo,A FANAL(03-16), from The History on Wheels series. Wood, paint, objects and videos. Contemporary Art and Design Museum, San Jose, Costa Rica, 2016. This work calls for Thai residents in Taoyuan, Taiwan to held workshops, for which they provide objects related to the creative process of this work.